On Saturday, Natalie's first birthday was cancelled due to serious black rain. It was so bad in some parts of Hong Kong that they closed highways, shops were flooded, and people had to be saved from minibuses that had gotten stuck in a 70cm puddle of water! 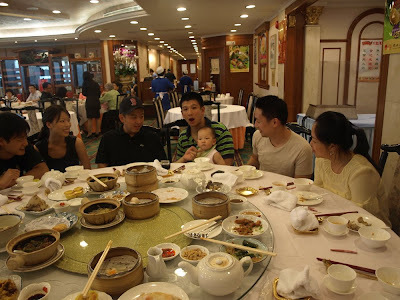 Although there was no mega-glam party out on the waters, some friends were brave enough to venture outside and join us for a casual dim sum at Victoria Seafood in Citic Tower. It was a very yummy and chill lunch. Natalie received some very nice gifts from her aunties and uncles (and yes, you are ALL aunties and uncles now!) 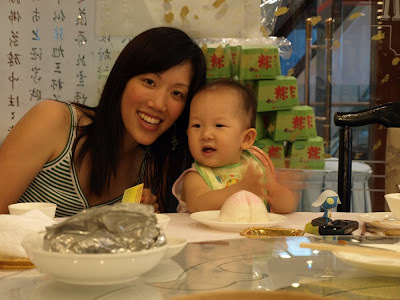 and enjoyed her first bite of a bum (traditional birthday bao). See pics below. Natalie with her proud parents at dim sum. She can eat just about everything now (except nuts), including egg, beef, tomatoes, and even traces of seafood. 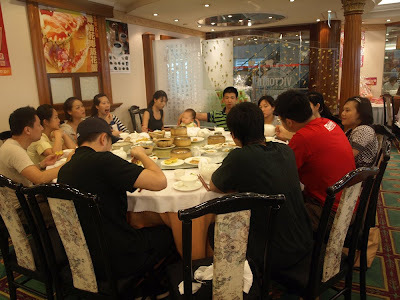 Natalie and our close family and friends enjoying the dim sum. If you ever eat at this restaurant, you must order their salt n' pepper tofu. We had three orders! Natalie had a great time playing with so many aunties and uncles. You can tell from this shot that Natalie's the star of the day with everyone watching her, waiting to jump at her every command. When Natalie claps, the whole table must clap with her. Natalie hanging with Serena, Vivian, and Marian. Natalie is holding on to little cute finger puppets from Gerald and Marian. One of the puppets looks just like bam-bam from the Flintstones. There is a tiger finger puppet that Natalie likes to kiss. 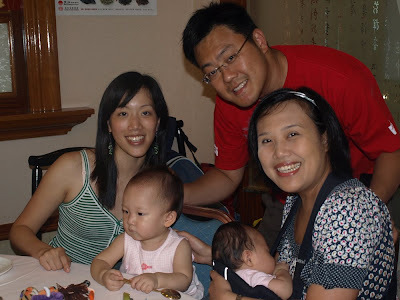 Natalie with Uncle Jason and Auntie Corine. The last time Natalie saw them, she fell asleep on their guest bed with her bum in the air. Since then, she always sleeps with her bum in the air now. Natalie with Dom, Lieny and little baby Evana. Evana is less than 3 months old but she is really big already! Natalie smiling at the camera with Cindy Yee-yee. The three babies Vicky (4 months), Evana (2 months), and Natalie (12 months). It's probably best not to say how many months Tracy and Lieny are. 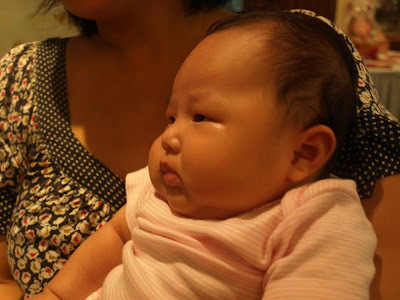 Look at baby Evana's super cute and super round face. 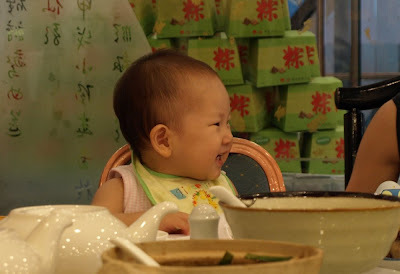 She's quite young, but already she knows how to smile and laugh with people now! Natalie and Evana "playing" together. Baby Vicky taking a nap in her sling. So cute. Natalie and Cindy playing with a really cute bowling set given to her by Dom, Lieny and Evana. Just today Natalie was playing with them by herself and giving each of the bowling pins hugs and kisses. She has become more affectionate lately and will crawl over to give us kisses. We love it (of course)! Natalie's new ralph lauren dress from Corine and Jason. Thanks guys, it is sooo cute! She's just like a little lady now! When Natalie's bum (traditional birthday bun) came out, we all sang "Happy Birthday" to her. While we were singing, Natalie kept looking around with a "what's going on?" expression. After we finished singing and clapping, Natalie smiled and clapped her hands, too. Happy Birthday Natalie!